A few years ago, out of the blue, I received an email from an old climbing friend in Buxton. He had been contacted by Martin Kocsis from the British Mountaineering Council who was trying to track me down to request permission to use various quotes from my 1988 collection 'Hanging in the Balance' (now incorporated into 'While Giants Sleep'). 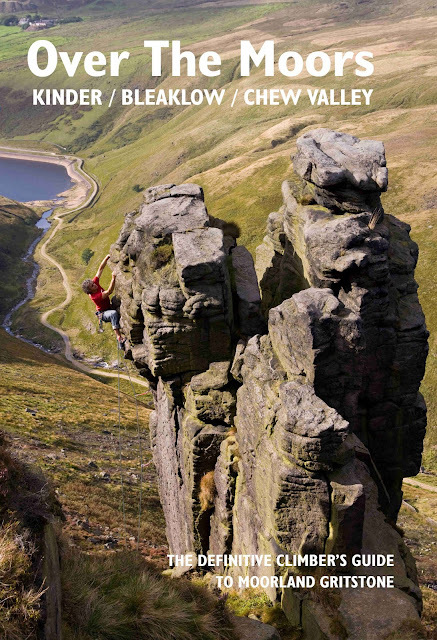 Martin, with Niall Grimes, was compiling a rock climbers' guide to the remote and wonderful climbing grounds in the northern reaches of the Peak District. I was deeply flattered that they wanted to use some of my material to accompany a set of beautiful photographs in this stunning new publication. In fact, it was this external corroboration, totally unexpected, that encouraged me to look again at 'Hanging... ' and, combined with my success in the Yeovil Prize, to contemplate producing 'Giants'. Climbing guides have always been special publications. I have a few from the 1930s, their terse accounts lacking any unnecessary verbiage and the routes illustrated only by a vague dotted line meandering up a rough sketch of the mountainside. It was an era of stoical self-determination and understatement - '...with some difficulty...' was usually code for a heart-in-the-mouth, clinging-by-the-fingernails move - although sometimes a suitable bilberry ledge where a pleasant pipe could be taken might also be recommended. Nowadays, these books are lavish productions which honor the historical development of the area, with marvelous archive photos, alongside details of breath-taking, contemporary developments. This part of the Peak District, especially the Kinder Scout and Bleaklow plateaus, has always been somewhere I've retreated to, often on my own, in all kinds of weather. I've been lost more than once, contemplating spending the night standing in my rucsac, and being spooked by stumbling upon old aircraft wreckage. I've known it with the heather ripe and dripping with purple and I've occasionally climbed on its coarse and roughened grit, seen the black tips of a mountain hare speeding away from me across the snow, heard the contemptuous, matronly cackle of grouse undercover somewhere out on the moor. The atmosphere of this landscape affected the mood of some of the pieces in 'Hanging ...' but I hadn't referred to the places specifically or by name. So, I'm doubly delighted; obviously, by being included in such a landmark publication but also by the fact that these editors valued my earlier booklet and, especially, that they considered that I had been able to evoke some of the moods and majesty of these high Peak District moors and crags. 'Over The Moors' edited by Martin Kocsis & Niall Grimes and published by the British Mountaineering Council will be published later in 2012. Thank you Megan. Kind and supportive, as ever.